It’s all about turquoise and pink on this lovely Friday- TGIF! I love this scarf because it is massive- I’ve even worn it as a sarong before! The colors are vibrant and seemed perfect for a summer afternoon. I typically have worn this scarf with white or yellow, so I thought I would switch-it-up and throw on some pink- one of my favorite colors! I highly recommend investing in scarves- they’re great ways to change a look without having an overcrowded closet! Do you all wear scarves? You’ll see soon that during colder months, I wear them pretty much daily. Here’s the scarf paired with yellow- which do you prefer? I can’t decide! On another note, I have some fun & fabulous news!! 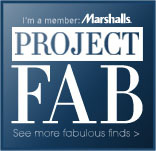 If you saw haven’t seen yet from Instagram, I am one of the semi-finalists in the #ProjectFab program by Marshalls! I can’t wait to show you all my #fabfound items from Marshalls next week… I have some awesome looks with new & old pieces. Weeee! Este look tiene todo que ver con la turquesa y la rosa este hermoso viernes- TGIF! Me encanta esta bufanda porque es enorme- La he usado como vestido para mi traje de baño también. Ya que estos colores son vibrantes, pensé que el look fue perfecto para una tarde del verano. Típicamente he usado la bufanda con una camisa o blanco o amarillo, pero hice un cambio a rosa. ¡Mi color favorito! Les recomiendo que inviertan en bufandas. Es una manera fácil para cambiar sus looks sin tener que comprar mucha ropa ni pagar mucho. Llevan bufandas ustedes? Van a ver- durante los meses fríos, las llevo casí cada día. Aquí está esta misma bufanda combinada con una camisa amarilla. 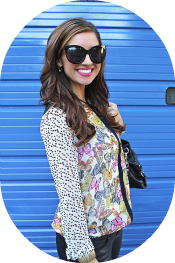 ¿Cuál look prefieren ustedes? ¡No puedo decidir! Cambiando de tema, tengo una noticias fabulosas para ustedes!! Si todavía no han visto en Instagram, soy una semi-finalista en el #ProjectFab proyecto, hecho por Marshalls. Apenas puedo esperar mostrarles todas las cosas de #fabfound en la semana que viene… tengo unos looks hermosos usando nuevas y viejas piezas. Weeee! Gracias por leer y que tengan un maravilloso finde! I’m trying something new today and knotting my t-shirt with my pencil skirt. I thought it would be a fun challenge to dress-up this top, and really, I figured out lots of ways to do it.. this being my favorite. I wanted to dress-up a bit, because I always am pretty casual on the weekends. I like to switch-it-up during the week though! In sorority world, we would call this look “snappy casual”… kind of like business casual, but with that Greek Life edge. ;) It’s the “I’m not trying hard, I just always look this cute for Sunday meetings” look. I wish everyday were a snappy cas day! Thinking of starting a sorority special on here, since I see the most adorable and stylish college girls at meetings every Sunday… stay tuned for more on that! Anyways, regardless of how I wear this top, I am just SO thankful to wear it without freezing! Yay for warm weather! While I don’t think it will stay here for too long, I will take a few days here or there while I can! Enjoy your Tuesday and thanks for reading! Llevo mi camiseta de manera nueva hoy. Pensé que sería divertido buscar maneras de llevar esta camiseta más formal, aunque es muy informal. De verdad, encontré muchas maneras de hacerlo… les muestra pronto! Este look fue mi favorito de todos. Quería llevar algo un poco más formal porque siempre me visto muy informal los fines de semanas. Me gusta cambiar mis looks durante la semana :) En el mundo de las sororidades, decimos “snappy casual” para describir este look. Es el look que dice “no tenía la intencíon de lucir tan hermosa…” jaja! Me encantaría su cada día fuera un día snappy cas. Y hablando sobre las sororidades… pienso en empezar una sección nueva de las chicas que veo cada domingo en las reuniones. Siempre se vistan de moda! Bueno… no importa como uso esta camiseta, aun si la llevo. No creo que vaya a quedar por mucho tiempo el clima y por eso disfruto estos días mientras que puedo. (Disfrutar= camisetas sin mangas!). Espero que tengan buenos días martes y gracias por leer!